Cost : ... Euros/ person (this price includes transporation by 4WD car, food materials needed during the trip in the jungle, payment to local guides, cook, villagers, and an overnight stay in a hotel in Sorong city). This price does not include airfare to Sorong city, travel insurance and other personal expenses. Payment should be done at least 2 weeks before the trip. You could send the cost by bank transfer or western union. I will provide the details by email. I can also arrange your snorkeling trip as a group tour to Raja Ampat islands in a separate itinerary. 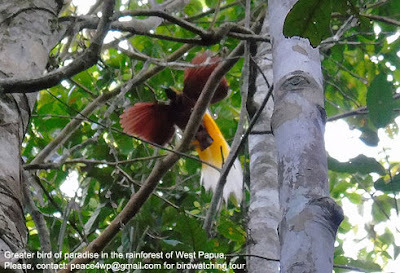 Tropical rainforest of West Papua is rich in bio-diversity. 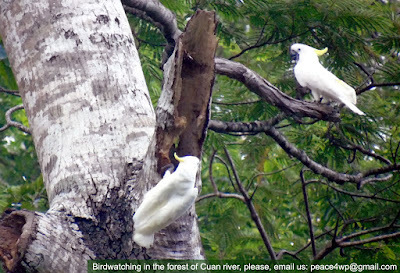 It is the natural habitat of various species of birds including birds of paradise, blyth's hornbill, and sulphur crested cockatoo. There are colorful butterflies and beetles that we can see while walking through the bush of the forest. Cuscus possum, soa-soa lizards, wild pigs, cassowary birds and deers may be seen as we spend more days exploring the jungle. This tour is suitable for nature lover who wants to explore the forest and at the same time support us in preserving this precious eco-system through eco-tourism. We will wake up to have morning tea and begin to do a morning walk along the river to watch Lesser Birds of Paradise. After breakfast, we will start walking deeper into the jungle along the banks of the Syuan river. 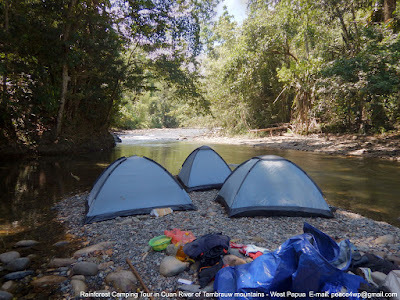 We will do several crossings in the river to shorten our trip so that we will be able to arrive at our second camp site. Lunch will be prepared while local guides rebuild your tents. You can refresh your body by swimming in the crystal clear water of the river. After lunch we will do a little exploration in the jungle to see the plants or trees that are used by the indigenous Papuan people for medicines, making hunting device, or for constructing their traditional houses. Before sunset, the birds are usually active, we need to come out of the jungle and walk along the banks to watch birds that fly above our heads or perch on the branch of trees to eat fruits. Dinner will be served before dark. At night, you will be able to sleep in the jungle surrounded by the sounds of water flowing in the river, and insects or night birds. 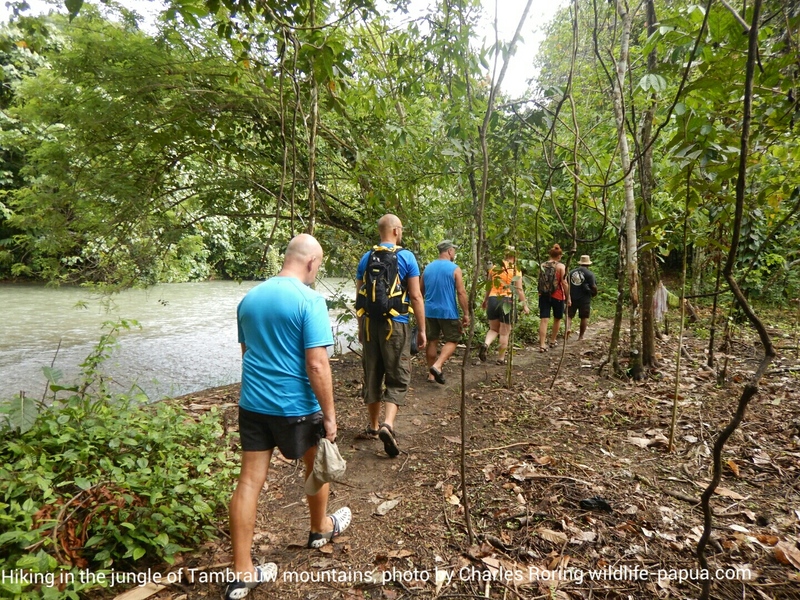 In the morning, after breakfast, we will walk deeper into the jungle to another camping ground. While we rebuild our tents, you can refresh your body again by swimming in the fresh water of the river. Or you can choose to do your own exploration of the birds or vegetation of the tropical rainforest. There are a lot of colorful butterflies that we can see in the forest. Local people will show you how they catch fish or shrimp using traditional hand-made fishing gear. We always have the chance to eat fried shrimps which are the daily catch of the local people. At night, we will have a short walk into the jungle where local guide will try to imitate the sound of female cuscus to attract the male one. Birds such as sulphur crested cockatoo, yellow faced myna, black capped lory and goliath cockatoo usually can be found in this deeper forest. After morning tea, we will start dismantling our tents and begin walking back to the main road. Before getting into the car, we will have our final brunch (breakfast + lunch) and some tea or coffee at the bank of cuan river. After that we will leave the river for the nearby Sausapor town which is the temporary capital of Tambrauw regency. We will have a short walking tour around the small town that used to be the base for American troops in 1944 during their war against Japanese forces. We will leave Sausapor town for Sorong city that afternoon. It will be a 4-hour ride. We will bring you into a hotel where you can spend one night there before being transferred to airport the next morning. Bring water-shoes, flip-flop and light clothing (t-shirts, shorts, socks) for walking in the tropical rainforest and crossing the rivers. Also bring your swimsuit if you want to swim in the crystal clear water of the river. And then fly from Jakarta to Sorong city. We will meet you at the airport to organize the tour and guide you to Cuan river where you will spend several days in the forest to explore the beauty of Papua's nature.